Sometimes life is not all about balance. For example, this is by no means a perfectly balanced mac and cheese (I know, way to sell it, right?). There’s some cheese in here, but nowhere close to four cheeses. Nothing is truffled, or bacon-ed, or cauliflower-ed. There’s some mac – but, all and all, it’s pretty light on the (quinoa) pasta to “other stuff” ratio. This is the kind of filling, yet, not-over-the-top meal that I like to eat in an every day sort of way. These days, in particular, I’m into meals that are overwhelmingly jam packed with green things. I also happened to have all of these items in my fridge, so this was also a total impromptu weeknight meal. If you have some cashew cream leftover (like I did), it’s especially quick to put together. 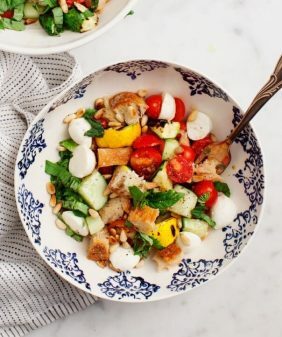 This came about as I was getting ready to toss those (above) ingredients together into a salad like this… but since I can’t even follow my own recipes, I got the last-minute idea to switch it up and bake this thing instead. Since no green meal is complete without unmeasured handfuls of fresh herbs, I plucked and added some basil and sage from my yard. I usually think of sage for fall, but it really added a nice rich flavor in contrast to all of the fresh, bright things. (Although, I think tarragon would offer a nice savory note as well). And just to un-vegan and un-gluten-free things, I added some panko and grated comté cheese to form a crispy crust. Which – really – sounds fancier than it is. Jack always grabs handfuls of random cheeses from the remnant bin at Whole Foods so we always have interesting assortments on hand. Feel free to use parmesan or pecorino if that’s what you have. (Or see the notes below to adjust this to actually be vegan or gluten free, if need be). Use a high speed blender to blend all ingredients for the cashew cream. Taste and adjust seasonings, set aside. Coat the bottom of a 9x13 (or similar) baking dish with a little olive oil. Toss about ¾ cups of the cashew cream with the cooked pasta. (I did this right in my baking dish to dirty less dishes). Add the asparagus, peas, mozzarella, herbs, a few pinches of salt & pepper. Fold everything together so that all ingredients are coated and evenly disbursed, then gently press it into the pan to form an even layer. Top with grated comté (or parmesan), panko bread crumbs, a drizzle of olive oil, salt, pepper & a few pinches of red pepper flakes. Bake until the crust is golden brown, about 20 minutes. Vegan version - omit all cheese and use more cashew cream. 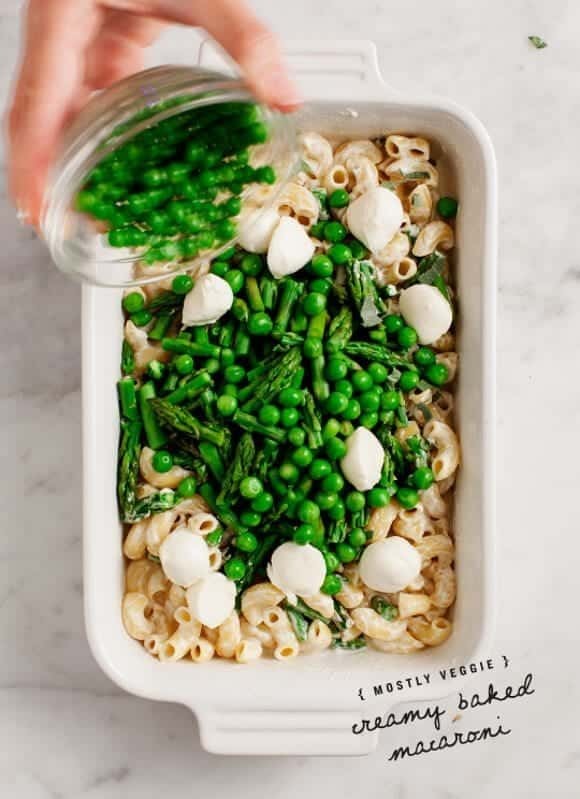 No-bake version: blanch veggies (for about 30 seconds in boiling water), then toss everything together and serve in bowls. Love peas! Oooh and I love the use of the cashew cream. Looks so good. We have the sad reality: my husband is allergic to both dairy and nuts. I might have to try this with some sort of tofu or coconut, because it looks delicious. Also, I made your soft pretzels over the weekend and they are SO GOOD. Oh my goodness that looks heavenly. I love the addition of fresh mozzarella balls, those make everything better. 🙂 And quinoa pasta sounds interesting, I’ll have to look for it at the store. Fresh mozzarella is amazing on everything! P.s. Beautiful photography as ever – the dream is to have my own marble counters one day!! whoops! Double commented…and now triple commented. More love from me to you, I suppose! 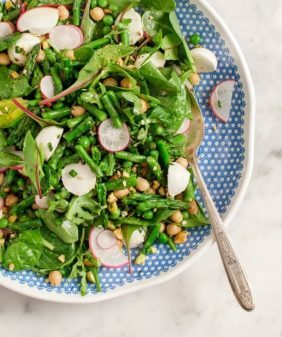 This sounds heavenly – I love the abundance of spring greens right now. I’m trying to fit them into every meal, so may have to add this recipe to the to-do list. 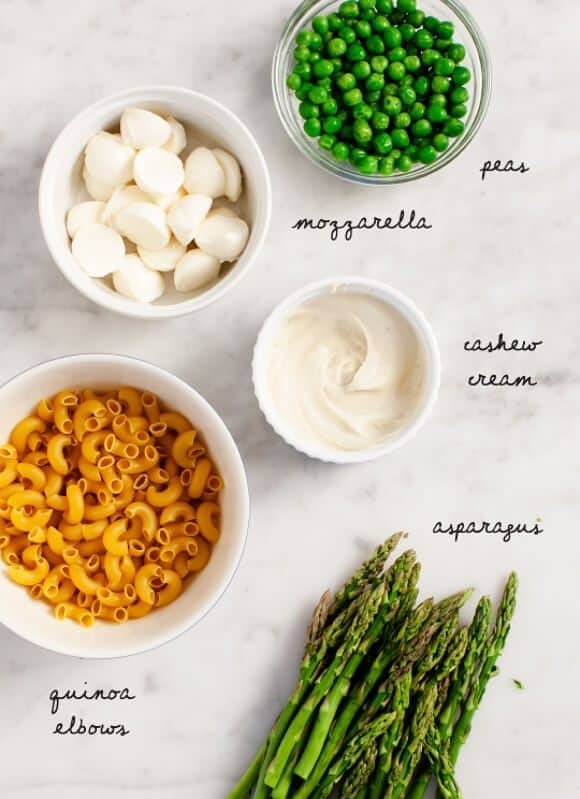 This looks great – I love Mac n’ cheese and this looks so good. Hooray, super-veg pasta! I’m intrigued that you’re using both cashew cream and dairy cheese in the same dish. I guess that combination just never occurred to me, since so many people use cashew cream for totally vegan dishes. I’ll have to give it a try! I know, such a contradiction! To be honest, I just happened to have some cheese and some cashew cream leftover so it all went in! Also, I can have some cheese, but I can’t have loads of it (with heavy cream), and I just love the taste of cashew cream. I love a good baked pasta dish, and this one looks delicious! I have to admit that I immediately began wondering how and where I could fit in some bacon, but the thought of making it light but hearty like you have here is too good to pass up! Thanks for the inspiration! Perfect! Total yummm. A beautiful side dish or meal. Finally, for a change someone is doing something to help pigs live a bit longer. Whew. I (our entire family) do not consume bacon. Or anything related to it. The world is going bonkers adding pork to e-v-e-r-y-t-h-i-n-g. Becoming an ongoing illness in society. Truth be told, very dangerous and unhealthy to keep including in daily meals and/or desserts. Just awful. 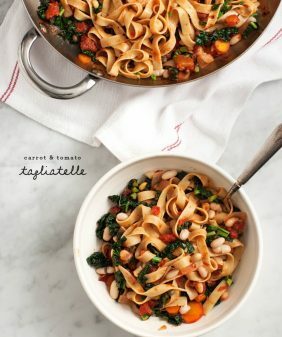 I love the idea of adding veggies to a heavy pasta dish! 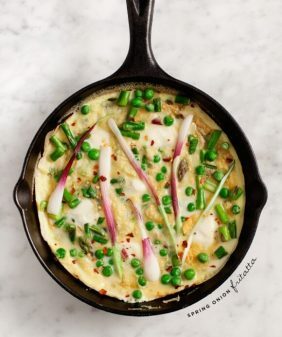 The cashew cream looks intriguing, and I bet it’s fabulous alongside green veggies! Delicious! I’ve never made cashew cream before but I will be sure to give it a try. I might replace some of the vegetables with more seasonally appropriate (winter down under) vegetables like mushrooms perhaps. Thanks for the weeknight idea! This looks so delicious! I am GF but I have some gluten free breadcrumbs that are excellent I can use instead of the panko. Can’t wait to make this. This looks awesome! My daughter is allergic to cashews. What could I use in place of the cashew cream? I’ve also made the cashew cream with almonds (if that’s an option), you just have to soak them a bit longer so they soften enough to become creamy. Okay, this one is a winner. Yes, it can’t always be a perfect balance but I’d still say this is a pretty beautiful and balanced meal if you ask me. 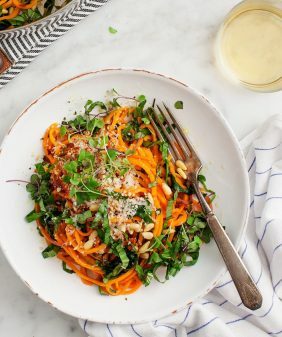 Love quinoa pasta and the cashew cream in this….will be trying this soon! This sounds ridiculously delicious and is now making my supper of sad leftovers seem even sadder. Those colors! POWsa! This looks incredible and I want to make it asap! However, I am not vegan but love to incorporate vegetarian dishes into our weekly diet. Is there something I can use instead of cashew cream? Some mascarpone cheese might be a nice easy substitution – just taste test for salt and maybe add some minced garlic. This is beauuuutiful! And perfect for spring, too! My casserole is baking in the oven right now! Followed the recipe mostly as written. I’m using whole wheat elbows instead of quinoa, and I’m trying out the tarragon suggestion – and I’m subbing in plain yogurt instead of cashew cream, since I’m not vegan. Also because I very much wanted to make this for dinner tonight, and I’m super impatient 🙂 thank you for this delicious recipe!! This is really very convenient that I’ve just found this because I’ve bought some asparagus to try and had no idea what to do with it! Well now I do so thank you! This looks so delicious! I love making comfort foods healthier by adding some greens. Can’t wait to try this out! This is amazing and I want to try it but for nutritional sake, I’m supposed to track everything I eat so does anyone know the calories per serving, and any other nutritional factors for this? Thanks Sonja and Jeanine! I’m making it right now and I had the same concerns with the amount of pasta as well. It looks delicious and I am so excited to see the end result! I ended up using close to a half a box of uncooked pasta and added some extra veggies to get a full pan. I didn’t have cashews so I used some whipped cream cheese and thinned it out with some water. That’s a great looking recipe, I was wondering if you think it will work as good with truffle oil? I bought some from here http://www.trufflehunter.co.uk/truffles/buy-truffles.php?c=Truffle-Oil and I am currently looking for great recipes like this. brain that how a user can be aware of it. Thus that’s why this article is amazing. Thanks for this delicious recipe! 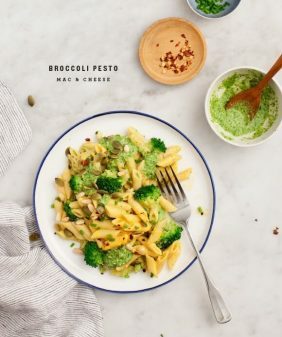 I made it tonight with broccoli instead of asparagus (just because it was what was on hand) and it is delicious. Love your site. I used Daiya Jack Cheese instead of mozzarella, and this was AMAZING. It impressed my husband and his dad, who I met the day I made this. Thanks for sharing! Apart from being allergic to dairy, I find mozzarella… boring. (Sorry everyone!) The jack substitute is rather on the sharp side, but we loved it.